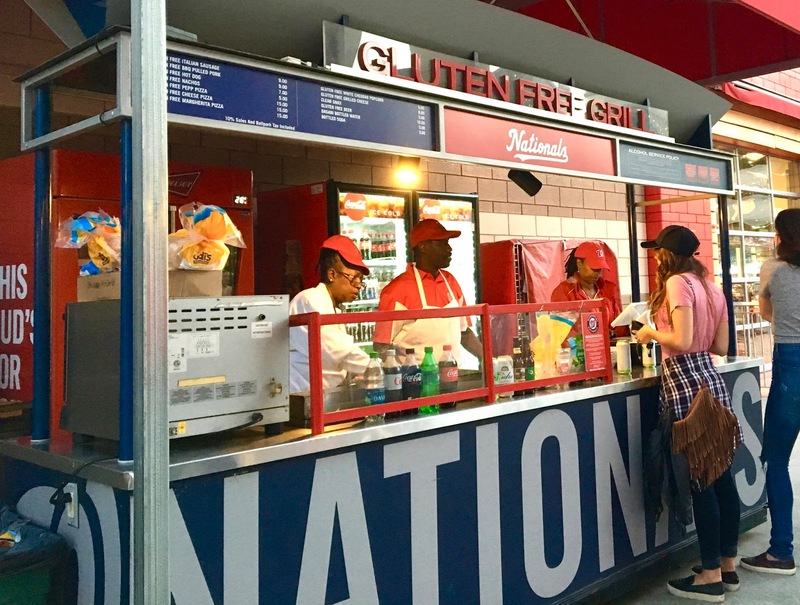 The dedicated gluten-free concession stand is located at section 100 on the main concourse. Find it behind the Budweiser Brew House. You'll find hot dogs, sandwiches, and pizzas, along with an assortment of snacks. Bread-based items are served on Udi's products. They have Omission beer on hand, but celiacs and severely sensitive people should note that that beer is "gluten-removed." I didn't ask if they had information for other allergies- especially since most items contained dairy. My dad ordered the gluten-free hot dog to test despite not being gluten-free. 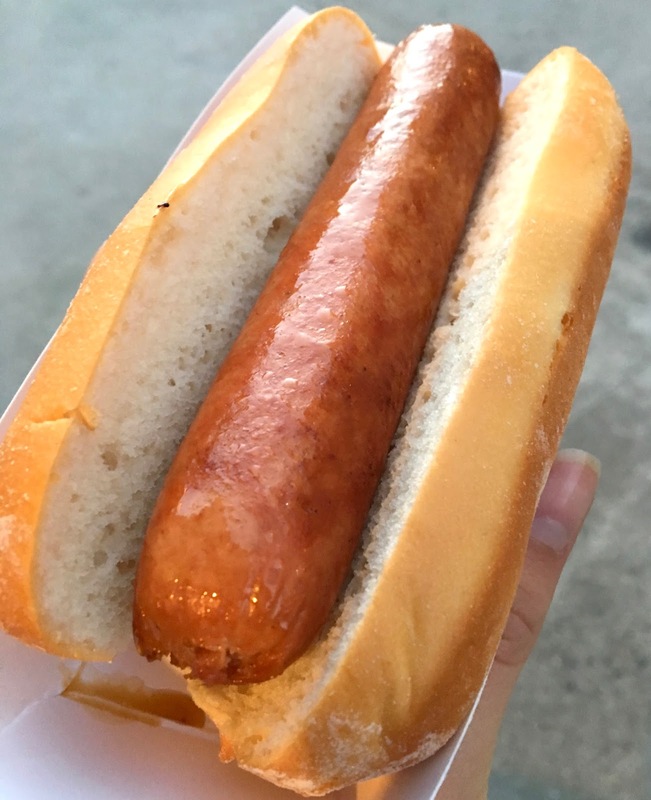 The hot dog tasted "normal" but he did note that the bread was crumbly, as it was not toasted. Hot dog topping stands can be found around the park with ketchup, mustard, relish, and onions, but there are no dedicated stand for toppings so there is a chance of cross contamination if you choose to dress up your hot dog. 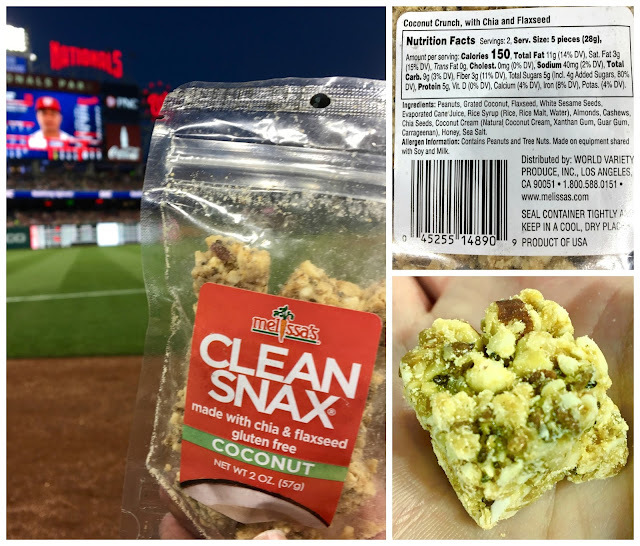 Since I skipped the entree items, I purchased the Melissa's Clean Snax, on the suggestion of the concession stand's friendly staff. They were sweet and crunchy, reminding me of granola in a way. I normally don't go for anything with coconut in it, but I actually loved the clusters and finished off the whole bag. Note that they are made on shared equipment with soy and milk and contain peanuts and tree nuts. Hard coolers or ice chests"
Although I ate before the game and only had a snack, it was nice to see a dedicated gluten-free stand so that celiacs and gluten-free eaters alike can enjoy the full experience of going to a baseball game. The staff were enthusiastic, and truly cared about serving up food for everyone. Find out more about visiting Nationals Park on this website. Disclaimer: This review is based upon the information I have at the time of the review and does not reflect changes in ingredients or availability of items. Please contact Nationals Park directly for up-to-date information and feel free to contact me with any questions or comments. I was not compensated for this review and it is a reflection of my personal opinion. They did away with the stand for 2018 spring training.... seriously DISAPPOINTED!!! Hi Dennise- This review is of their ballpark in Washington DC. I'm not sure about GF options at their Palm Beach spring training stadium.